Edwin Perry Curbow was the youngest known son of Oliver and Harriet McGuire Curbow, the grandson of Tilman and Elizabeth Box Curbow, and my husband’s 1st great grand-uncle. 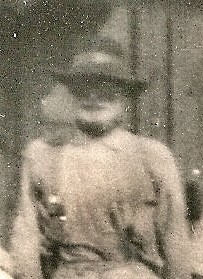 Edwin was born 1 July 1884 in probably Clay County, Texas. As with many records of this Curbow generation, there is a conflict in his date of birth. His Texas Death Certificate states that he was born in 1885 and his burial record states that he was born in 1886. The 1884 date is taken from his World War I Draft Registration Card, which he filled out in his own hand. For our purposes here, I will use the 1 July 1884 date. 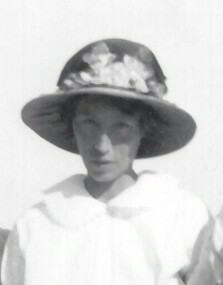 Edwin married Betty Francis Howard on 22 March 1904 in Denton County, Texas. 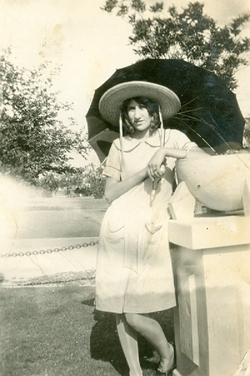 Betty was born 11 Dec 1886 in Lebanon, Collin County, Texas. Betty was the daughter of William Green Howard and Sarah “Sallie” Mae Seago. Betty was the younger sister of Ida Bell Howard (my husband’s great-grandmother). Ida Belle married Charles Franklin Curbow. 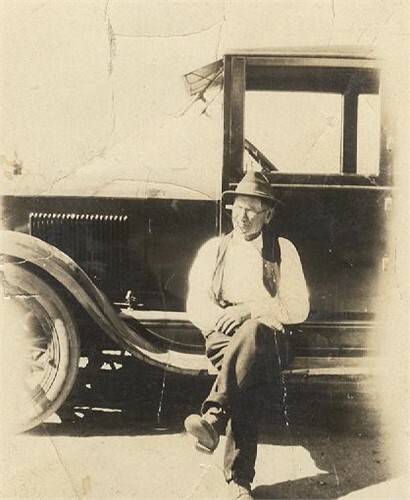 Prior to 1920, Edwin Perry Curbow moved his family to Frederick, Tillman County, Oklahoma. They lived there for 21 years before returning to Texas. Edwin and Betty settled in El Paso where they lived out the remainder of their lives. 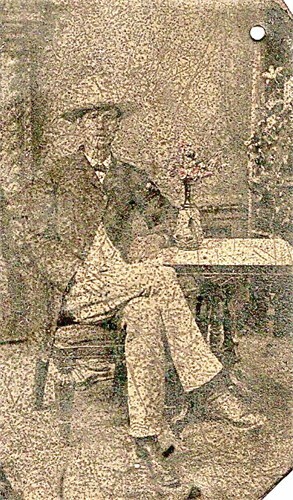 According to the census records, Edwin farmed the land throughout his life; however his death certificate indicates that he was also a “watchman” for the American Furniture Company. His great granddaughter, Pat Blair Chatman, tells us that the family traveled all over Texas in a covered wagon, moving from farm-to-farm picking crops. 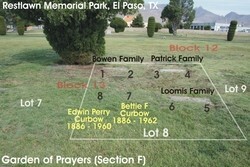 Edwin Perry Curbow died on Jun 1961 in El Paso, Texas. He is laid to rest with his wife in Restlawn Memorial Park in El Paso, Texas. Published 13 June 1961 in The El Paso Herald Post – Mr. Edward (sic) P. Curbow, 75, 158 Coronado Road died in a local hospital. Survivors, wife, Mrs. Betty F. Curbow, El Paso; daughters, Mrs. Lee Blair, Huntington Park, California and Mrs. F. H. Sinpe (sic – should be Slape), El Paso; Sons, Joe Curbow, Chickasha, Oklahoma and David Curbow, El Paso. Arrangements with Hardin and Orr, Mountains Ave. Published 28 October 1962 in The El Paso Times: Mrs. Betty F. Curbow, 76 of 3120 Fillmore, died Friday at a local hospital. Resident of El Paso 20 years. Member of First Christian Church. Survivors include two daughters, Mrs. Hays Slape, El Paso, Mrs. Cora Blair, Huntington Park, California, Son, Joe Curbow, Chickasha, Okla; Two sisters, three brothers, five grandchildren and nine great-grandchildren. Funeral services will be held 10 a.m. Monday in Hardin Orr & McDaniel Montana Ave. Chapel Rev. Thomas Gowan officiating. Burial will be in Restlawn. Arrangements by Harding-Orr & McDaniel Montana Ave.
Joe P. (probably Perry) Curbow was born 26 Aug 1905 in Denton County, Texas. He married Nannie Pearl Nelson. The couple had no children that I am aware of. Joe P. Curbow, 63, 515 Florida Avenue, died at 1:15 p.m. Friday at his home following a sudden heart attack. He had been a heart patient for 17 years. He was born Aug 26, 1905 in Denton, Texas. He had been a resident of Chickasha since 1935. He was formerly employed with the Pearl Laundrey. He joined the Chickasha Police Department Aug. 1, 1944. He retired March 15, 1967 after 23 years of service with the department. 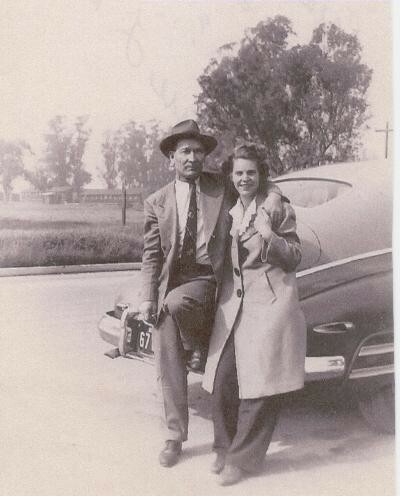 Mr. Curbow was married Aug. 5, 1946 to Mrs. Pearl Nelson in Chickasha. He was a veteran of World War II having served with the U.S. Navy. He was a member of the Calvary Baptist Church. Survivors include his wife, Pearl of the home; one step-daughter, Mrs. Geneva Mae Gonzales of Chickasha; two grandchildren; two sisters, Mrs. Katie Slape of El Paso, Texas and Mrs. Cora Mae Blair of Huntington Park, California. Funeral services will be at 10:30 a.m. Monday in the Chapel of the Sevier Funeral Home with Dr. Charles Sullivan, pastor of the First Baptist Church officiating. Interment will be in the Rose Hill Cemetery. Cora Mae Curbow was born 17 Feb 1907, probably in Aubrey, Denton County, Texas. She married Jessie Lee Blair on 2 Oct 1927 in Wichita Falls, Texas. 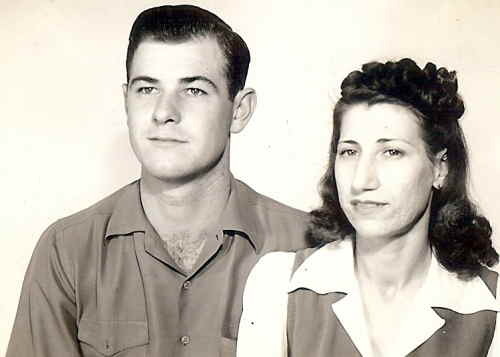 They had two children, Joe Lee Blair (1928-1984) and Wanda June Blair (1930-2006). Cora died on 18 Oct. 1984 and Lee died 28 Nov 1974, both in California. They are laid to rest together in Rose Hill Cemetery in Los Angeles County. Charles “Charley” Franklin Curbow was born 9 Jun 1909, probably in Aubrey, Denton County, Texas. He was named after his uncle, Charles Franklin Curbow. Sadly, Charley lived only 8 years. He died of “congestive chill,” an old medical term for malaria. He is laid to rest in Belew Cemetery in Aubrey, Denton County, Texas. 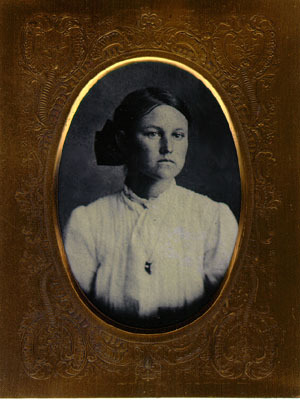 Jessie Daisy Curbow was known as “Katie” to her family. She was born 21 Oct 1911, probably in Aubrey, Denton County, Texas. 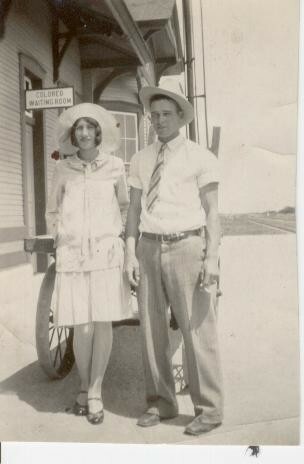 On 1 May 1934 she married Finley Hays Slape in Dewey County, Oklahoma. Katie died 26 Feb 2000 and Hays died 1 Jan 1998, both in El Paso, Texas. They are laid to rest together in Restlawn Cemetery. 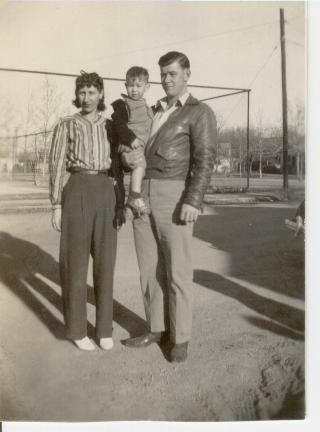 David Charles Curbow was the youngest son of Edwin and Betty Curbow, born 4 Nov 1915 in Aubrey, Denton County, Texas. Some time around 1936 David married Maxine Lavern Courtney. The couple had one son, David Charles Curbow, Jr. born in Oklahoma in 1936. The marriage did not last, and the couple divorced when the baby was just three months old. David Charles Curbow served as a Corporal in the U.S. Army during World War II, enlisting on 18 Aug 1943. Some time after his return from the war, David married Hope Hoyle. The couple had one son, David Hoyle Curbow. David Charles Curbow died at the young age of 45 on 30 Jul 1961 of pneumonia in El Paso, Texas. He is laid to rest at the Fort Bliss National Cemetery in El Paso. Sometime around 1907 he married Hattie – her last name is unknown to me. In the 1910 census he was living with her in Collin County, Texas. The couple had four children: John S. in 1907; Fannie Mae in 1909; Enola B. in 1912; and Bethola M. in 1914. I don’t know if Hattie died or if the couple divorced because by the 1920 census, Jessie has remarried to Susie Annie Hyden. His children are with him. Jessie and Annie had six more children: Archie B. in 1918; James Ira in 1919; William Franklin in 1921; Vera Belle in 1922; Clifton Eugene in 1924; and Doris Evelyn in 1928. When Jesse filled out his World War I Draft Registration card in September of 1918 he stated that he was a self-employed farmer. He described himself as being of medium height and build with gray eyes and brown hair. His grandfather Tilman Curbow had gray eyes. 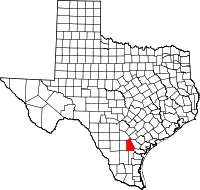 The family lived in Collin County until 1923 when they relocated to Live Oak County. 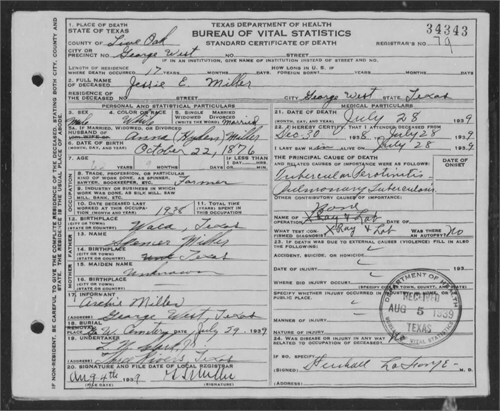 Jessie Eugene Miller lived the rest of his life there until he died of tuberculosis in George West, Live Oak County, Texas on 28 July 1939. As an aside, the town of George West was founded by George Washington West and Katie West, land venturers and cattle barons. I am sure they some how fit into our West family – but that is another research project for another day ! Jessie Eugene Miller is laid to rest in George West Cemetery. In tracing some of the Jessie’s children – I found that Archie B. Miller lived and died in the Giddings/Lexington, Lee County area – which is not far from where we are. 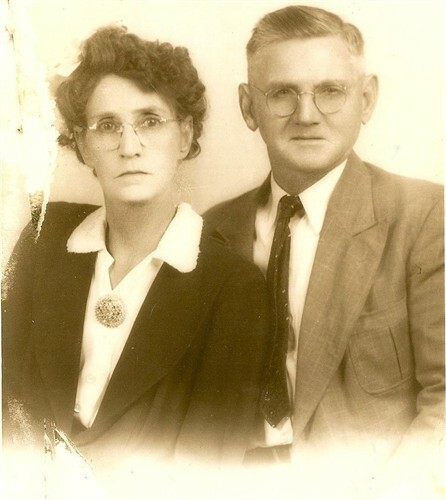 If any of the children and/or grandchildren of Jessie Eugene Miller or Archie B. Miller come across this post – we would love to visit with you to share information on the Miller/Curbow genealogy. Onward – breaking down those brick walls is so much fun ! Lou Ida Belle Miller was my husband’s first cousin (3 times removed) and the loving grandmother of fellow family researcher Tom Hedges. Most of the information that I have on Lou Ida Belle comes generously from Tom. Lou Ida Belle Miller was the youngest daughter of Harriet Curbow and Elijah Spencer Miller. She was born in Itasca, Hill County, Texas on 3 June 1892. On 27 Jan 1907 (at the tender age of 14 years old), Lou Ida Belle married Jesse Monroe Mason. A short nine months later in September of 1907 Jesse Mason died. Out of this union came one child: Jessie Isabel Mason who was born on Christmas Day 1907. By the age of 20, Lou Ida Belle Miller has remarried. Her new husband is James Monroe Watson. The couple had six children: Minnie Estel in 1912; Bonnie Gertrude in 1916; John Edward in 1918; Ruby Pauline in 1920; Willie Mae in 1925; and James Thomas in 1929. The family lived in and around the Carter County, Oklahoma area until 1933 when James Monroe Watson died following a surgery. shared with me about his grandmother: My grandmother moved with all her children to Arizona to find work. With the great depression and ‘dust bowl’ during that time, they were among the many ‘Okies’ that moved west to find work. All of her children stayed in Arizona, except for one. 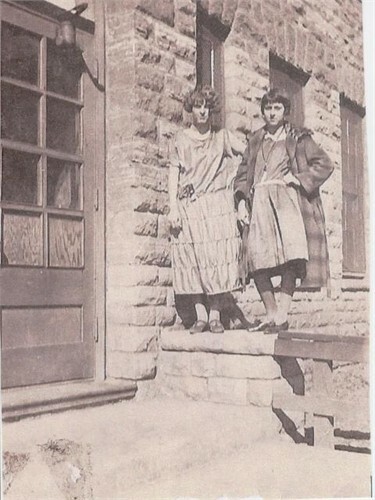 Her daughter Ruby Pauline and Ruby’s husband Robert Harris moved back to Oklahoma, and remained in Oklahoma the rest of their lives. 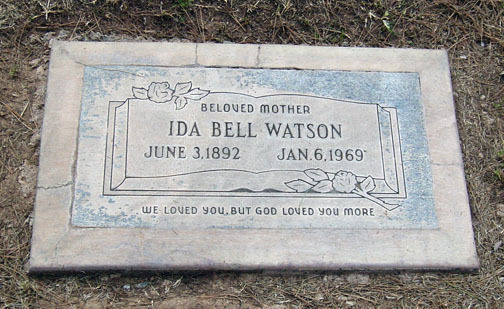 Lou Ida Belle Miller Watson died in Phoenix, Maricopa County on 8 Jan 1969. She is laid to rest at the Greenwood Memorial Lawn Cemetery. 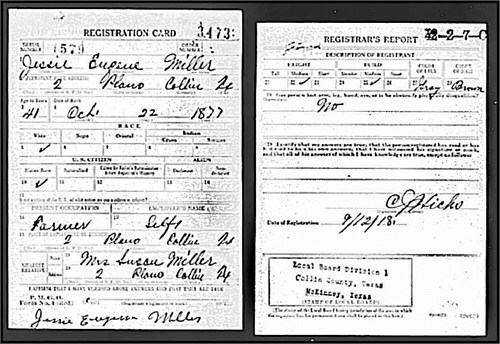 Willie Mae Miller was born sometime around 1890 in Texas (either McLennan County or Hill County). She was one of the daughters of Harriet Curbow and Elijah Spencer Miller. Because her birth year fell during the missing 1890 census – and the 1900 census where the Miller family cannot be found – I never even knew that Willie existed until Tom Hedges told me about her. 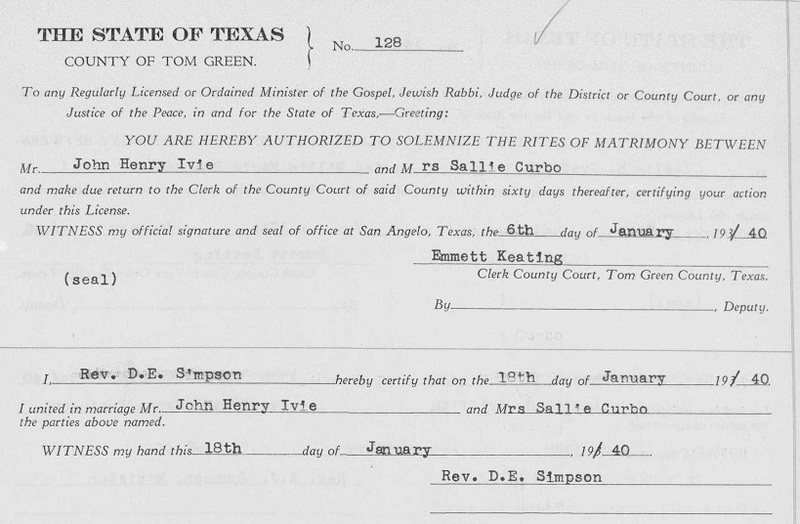 Based on the birth year of her first child and 1910 census record, Willie married in 1907. She married John Wesley Mason (the brother of Jesse Monroe Mason (first husband of Willie’s sister, Lou Ida Bell Miller). The couple had four children: Pearl Lee Mason (a male – 1908-1992); Thomas Wesley Mason (1910-1979); Ethel Mason (1913) and Spencer Mason (1923-1984). The family lived in Caddo and Carter Counties through the 1930 census. It is believed that after the death of Willie’s husband, she and the children migrated to California. There she lived until her death on 21 December 1971 in Stanislaus County, California. I would be interested in hearing from any of Willie’s descendants who could provide me with the location of her final resting place. Just when I had about given up on finding new information on Elijah Spencer Miller and his family — today I stumbled on a family tree on ancestry.com that I had never seen before. Imagine my shock and surprise when I found two pictures of Elijah that I had never seen. I have contacted the owner of the tree in hopes that they can shed some light on the life of Elijah and wife Harriet Curbow and wife Rosa Mosby Long. Elijah looks very young in this first photograph. I’ll take a stab in the dark and assume that this photograph was taken in Waco while he was married to Harriet Curbow. Elijah looks much older in this second photograph and my assumption would be that it was taken in Oklahoma. I am hopeful that I will hear back from the owner of the tree. It appears that they are descended from Cleo Hazel Miller (the oldest daughter of Rosa Mosby Long and Elijah Spencer Miller). Stay tuned for further updates and Elijah and family!